John Middleton (left) showed his hand months ago, and it seems like that bold move is about to pay off. At the time, John Middleton’s mid-November declaration to USA Today that the Phillies expected and were happy to spend a fortune on player acquisitions this offseason – “and maybe even be a little stupid about it,” he said – seemed an obvious and unforced negotiating mistake by an impetuous owner. It wasn’t just that Middleton hadn’t kept his cards close to his vest. It was that he had announced to every other club in Major League Baseball and to every representative of every available free agent that he would show his hand, and then he did. The Phillies were open for business and apparently handing out blank checks, and surely one of baseball’s super-agents – perhaps Dan Lozano, certainly Scott Boras – would use Middleton’s transparency to extract the kind of budget-crippling contract that no player, not Bryce Harper, not Manny Machado, no one, could justify. Except here we are, nearly three months later, the Phillies’ pitchers and catchers due to report to Clearwater on Tuesday, and neither Harper nor Machado has signed yet, and the presumption throughout Major League Baseball remains this: If the Phillies don’t sign one of those guys, they’ll sign the other. 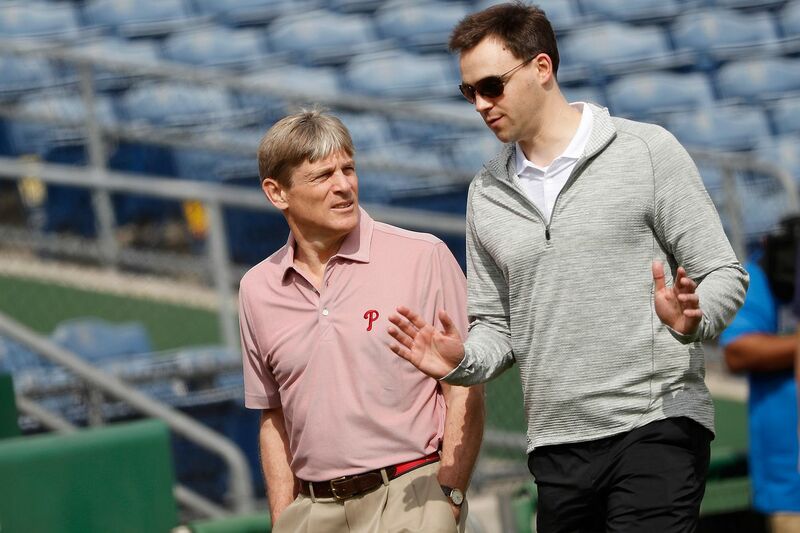 The circumstances of the offseason – whether you want to call it a market correction after years of owners’ shelling out long, lucrative contracts, or whether you want to accuse those owners of soft collusion to lower player salaries – have been to the Phillies’ benefit. Middleton’s assertion, in the wake of every team’s willingness to wait to sign either Harper or Machado, now appears a brilliant gambit. Maybe a team or teams will make Harper and/or Machado offers that can’t be refused. Maybe. But the likelier bet is that if one of those players was going to get a crazy contract, he would have gotten it by now. Again, spring training starts this week. The passage of time has contracted the parameters of any deal to which Harper or Machado might agree – what, is one of them going to sit out the season if he doesn’t get a 10-year, $300 million deal? – and the Phillies can best another team’s offer without necessarily having to pay the sort of exorbitant price that, say, the Miami Marlins did for Giancarlo Stanton or the Los Angeles Angels of Anaheim did for Albert Pujols. Both Boras, who represents Harper, and Lozano, who represents Machado, know that they can present any offer from any other club to the Phillies and say, John, can you top this? And if Middleton can’t or won’t, the Phillies will simply wish the player and his agent well – and pursue the other superstar. The key question, then, is this: Which agent will flinch first? Boras and Lozano have been playing a long and consequential game of chicken, one that has gone beyond merely getting the best deals for their clients. Boras doesn’t want to lose, doesn’t want to sacrifice the prestige and self-satisfaction of having Harper set the market as the majors’ highest-paid player, and the same is true of Lozano and Machado. The result of that duel is what we’ve seen: a free-agency saga that has stretched to the brink of spring training and that probably won’t end for another week or more. It could, but it probably won’t. The Phillies are fine with having to be so patient. They entered this process understanding, even banking, that there was little they could do to accelerate it, that Boras (and, in turn, Harper) would wait as long as possible before agreeing to any deal. To their credit, the Phillies have not made their offseason an all-or-nothing proposition contingent on one or two stars’ decisions. They have spent money and capital to improve. Last week’s trade for catcher J.T. Realmuto was merely the latest example, and those moves, they knew, would also them a more attractive destination for Harper and Machado. One would think it would. But it wasn’t the first such demonstration. The first happened last fall, when their owner opened his mouth, and, if the Phillies play this right, the last thing anyone should call John Middleton is stupid.